Housecats can be affectionate companions, greeting us with whiskery kisses, sharing long naps on sofas, and adding life, grace and beauty to any home. 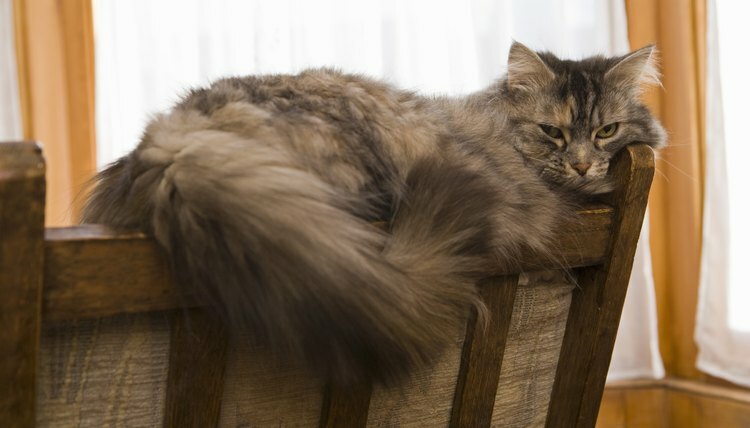 However, both male and female cats can develop the unpleasant habit of urine spraying to mark their territory, and they always seem to do it on your newest, most expensive piece of furniture. If your new leather sofa suddenly smells like the cat house at the zoo, don't panic. With a few simple techniques you can remove the scent, and get back to loving both your cat and your couch. Get to work immediately to disperse the smell by opening windows and turning on fans. You want to get the odor out as quickly as possible, not just for obvious reasons but to prevent the habit of spraying from being reinforced. The more times your cat sprays in an area, the harder the habit is to break. Identify the area that has been sprayed. If your sofa is dark in color, and if the spray is dried, you may need to use a blacklight, sold at petstores for the purpose of making urine stains visible. Test for colorfastness by spraying the enzyme-containing detergent in an inconspicuous spot on the couch, then wiping with a paper towel. Some leather dyes are water-soluble; if color comes off on the paper towel, do not use. Dilute white vinegar with an equal amount of warm water, add a splash of pet odor neutralizer, apply with the spray bottle, then blot. Repeat until the paper towels are free of discoloration and odor. Pamper your couch by using a good leather conditioner to restore sheen and flexibility. Discourage your cat from returning to the scene of the crime by covering the couch and surrounding carpet with aluminum foil for a week or two. Most cats don't like the way foil feels and sounds when walked on, and will avoid it. You can also try a potpourri bowl nearby filled with fresh orange peels; cats dislike the scent. If your cat isn't neutered, make an appointment with the vet to have this done. A spraying problem can often be corrected by spaying or neutering. Use a good animal repellent spray around your house, especially in gardens and on front steps. Often, indoor cats begin to spray in response to the presence of strange cats prowling outside.